Among the UCL Energy Institute's many developments and milestones of 2015, UCL-Energy celebrated the sixth anniversary of its formal launch. 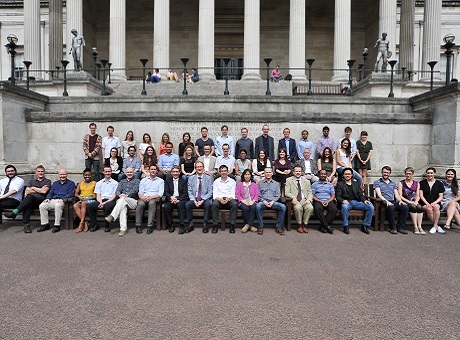 Since June 2009, UCL-Energy has grown from being a small upstart based on a handful of pioneers, to being to one of the largest academic centres for energy research in the UK, with our current complement of 14 full time academic staff, 41 RAs, and 55 PhD students. It is my privilege to use this introduction to record my thanks to Prof Tadj Oreszczyn, who provided the original vision for the institute, secured the initial funding, and then piloted it through its first five years. On Tadj’s and my own behalf, I would also like to record my thanks to Sir Malcolm Grant, who in October 2007 accepted Tadj’s proposal and provided steadfast support throughout the rest of his term as UCL Provost; to Prof Alan Penn, Dean of the Bartlett Faculty of the Built Environment, who provided the essential departmental and administrative base; and to Prof David Price, vice-Provost for Research, who continues to provide support and advice. We are also grateful to our new Provost, Prof Michael Arthur. The original vision for UCL-Energy was for a largely virtual institute with a core staff of two full time academics and three fellows, Dr Mark Barrett, Dr Alex Summerfield and Harry Bruhns. Initial funding was to be used to strengthen and focus existing UCL capacity in the demand side and energy efficiency in buildings, carbon capture and storage, off-shore generation and energy systems modelling, and to initiate cross-disciplinary working, particularly on the energy demand side with economics, laws and anthropology. These elements were intended to provide a focus for energy research from across UCL, to complement the long-standing dominance in UK energy research of the supply-side, and to help to address the big strategic question: how to decarbonise major industrialised economies, while maintaining the energy services that such systems rely on? This model rapidly broke down under the pressure of a series of developments: the success in March 2009 of our bid to run what became the London-Loughborough Centre for Doctoral Training in Energy Demand; the arrival of Dr David Shipworth and his team from Reading; and Prof Paul Ekins’ decision to move the UK MARKAL energy modelling team from King’s College to UCL-Energy. Within the space of a year, UCL-Energy went from being a virtual to a real organisation, with an administrative team, six full-time academics and an MRes/Phd programme. 2010 saw the arrival of Prof Andreas Schäfer and Dr Tristan Smith to form UCL-Energy’s transport research group, and 2011/2 saw the establishment of the Institute for Sustainable Resources under Prof Paul Ekins and Deputy Director, Prof Raimund Bleischwitz. In 2013, we launched our highly successful MSc in Economics and Policy of Energy and the Environment (EPEE), which recruited more than 50 students in its first year. The 2014/2015 Academic year has probably been our most successful and eventful yet. Our home faculty, the Bartlett has just completed a major reorganisation of UCL-Energy and its sister institute the Institute for Sustainable Resources, who have been joined by two new institutes, UCL Institute for Environmental Design & Engineering and the UCL Institute for Sustainable Heritage. Together these form the new Bartlett School of Environment, Energy and Resources, which is headed up by Prof Tadj Oreszczyn. As part of this reorganisation, I accepted the role of UCL Energy Institute Director, with the role of Deputy taken by Prof Neil Strachan, who also heads up our energy systems and modelling group. Other highlights of the year have included McGlade and Ekin’s paper in Nature on unemittable carbon, the publication of the Lancet Commission report on Health and Climate Change (reportedly in the top 1% of articles ever tracked, and the 4th highest ever published in The Lancet), and our largest number of PhD graduates yet. Despite more than six years of rapid and often unplanned development, key elements of the original vision remain: a demand-side perspective and a focus on energy use in buildings, an interest in the behaviour of the whole energy system, a focus on the empirical as well as theoretical performance, and the bringing together of the disciplines necessary to understand the behaviour and evolution of complex socio-technical systems that are found throughout the energy system, but particularly on the demand-side. The history of the UCL-Energy’s first six years suggests that the original vision was well chosen. So what of the future? The need to address the strategic question – climate change and energy security - has become more urgent, and it is abundantly clear that the consequent transformation of energy systems will take many decades. Energy research will therefore almost certainly continue to grow in importance, but with an increasing emphasis on supporting the deployment of energy systems at scale. Methods of research will need to be able to deal with rapid rates of contextual change, and research impact will become an increasingly important yardstick of performance. A key task for UCL-Energy will be to help to focus the capacity of UCL, as one of the world’s top universities, on this challenge. Transforming economies will require large numbers of highly trained people. UCL-Energy and UCL as a whole, have a major role to play, designing the courses and delivering the research-led education that will be needed. The scale of the challenge facing the UK and the world in the 21st Century is unprecedented. There is work to be done.